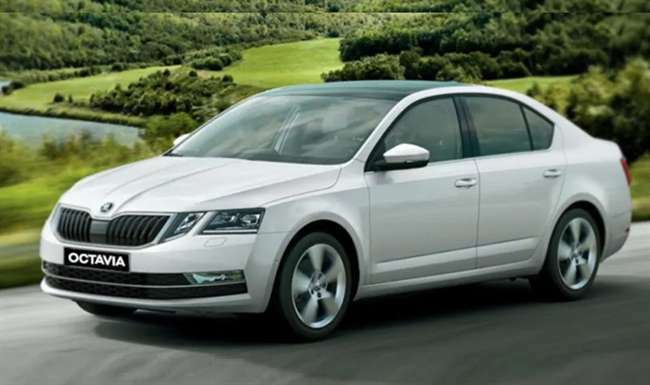 Skoda has introduced the OCTAVIA Corporate Edition in India. The Corporate Edition comes equipped with the 1.4 TSI (MT) petrol engine and the 2.0 TDI (MT) diesel engine and is now available across all authorized Skoda dealerships in the country, in Candy White colour scheme. It is priced Rs. 15.49 lakhs for the petrol engine variant and Rs. 16.99 lakhs for the diesel engine variant. The OCTAVIA Corporate Edition has a chiselled hood, massive and elegant front butterfly grille with chrome surround, and distinctive Quadra headlamps with LED DRLs. The side profile of the Corporate Edition has a tapered rear window. It has horizontal and sharply cut tornado lines and the R (16) Velorum alloy wheel which accentuate the dynamic appearance further. It also has subtle contours on the rear and the C shaped illumination. It has brushed decor on the front center console and door panels with dual tone Onyx Ivory front dashboard and the stylish beige upholstery. The OCTAVIA Corporate Edition comes with 1.4 TSI petrol engine which produces power output of 150 PS (110 kW), and the torque output of 250 Nm while delivering fuel efficiency of 16.7 kmpl. It achieves 0 to 100 km/hr in 8.1 seconds and reaches a top speed of 219 km/hr. The turbo-charged 2.0 TDI offers 143 PS (105 kW) power and comes with a six-speed manual transmission, as standard. The diesel engine option achieves a maximum torque of 320 Nm, 0 to 100 km/hr in 8.4 seconds, a top speed of 218 km/hr and an average of 21 kmpl. The standard safety equipment in the OCTAVIA Corporate Edition includes four airbags: dual front airbags and an additional set of front side airbags. This edition comes with 16.51 cm touchscreen central infotainment system and is equipped with SmartLink technology (Skoda Connectivity bundles supporting MirrorLink, Apple CarPlay, and Android Auto) that mirrors the smartphone for seamless connectivity and an undistracted drive. The Two-Zone Climatronic air conditioning system, with clean air function, is fitted with a humidity sensor that reduces the windscreen misting. This Edition also comes with ‘Shield Plus’ which incorporates the first year of comprehensive motor insurance and three subsequent years of third-party coverage, 24 x 7 road side assistance for the fifth and the sixth year, and an extended warranty for an additional period of the fifth and sixth year or 1,50,000 kilometres (whichever is earlier).